Making any house energy efficient poses a challenge. But owners of historic houses-take heart. These houses already incorporate many "green" energy-saving features. Older buildings were constructed before energy or central heat and air was readily available. Older houses were designed and landscaped to take advantage of their environment. Placement of windows and doors provided cool cross breezes in summer. Porches, shutters, and wide eaves offered shade, as did trees, whose bare limbs in winter let sunlight enter rooms that could be closed off from one another to retain heat. Before you make energy-saving changes, think about your house's inherent green and historic features. Try achieving energy savings in a way that is compatible with your house's historic materials and character. Identify what energy savings can be made in the short and the long term; what your budget allows, and what is desirable for the building. Start with simple steps. Use compact fluorescent light bulbs; adjust the thermostat to be cooler in winter, warmer in summer. Install insulating curtains. Consider shade landscaping. Remember your environment; on warm days close curtains or shutters on a sun-drenched side of the house, and open windows on the cool side to draw air through. Small steps can go a long way to reducing energy consumption yet avoid impacting historic materials or character. For bigger steps, install storm windows (click here for information on the April 2010 $1000 rebate) and doors, which minimally impact historic character or original materials. When making major changes, consider the historic qualities of your house. Rather than replace older items with new products, retain and repair historic building fabric, which is usually superior in craftsmanship and quality to newer materials. Consider, too, that the preservation and retention of historic materials conserves energy. Why? Because historic buildings contain "embodied energy," meaning the energy it took to extract those raw materials, and to manufacture, transport, and install them in the first place. When historic material is discarded, that embodied energy is wasted and additional energy is required to create the replacement products. With a little careful planning, you can enhance the energy efficiency of your house and be sensitive to its historic character. That's not only good for you and your house, it's good for the planet. Learn more at Historic HomeWorks. Learn more about how to care for your historic home with Camille Bowman's latest book, "Handbook and Resource Guide for Owners of Virginia's Historic Houses" (2008). Follow the link to purchase this invaluable guide for only $10. 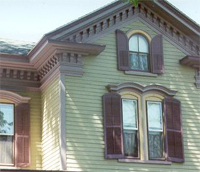 For a free on-line Guide for Historic Homeowners, click here. The energy saving suggestions and estimates were provided by Dominion Virginia Power as part of a partnership with the DHR.